The day dawned warm , still and cloudless. The sun rose above the trees on our boundary fence as I got into the car to go to the marina. It was hot and uncompromising and beat down like an oven grill on full for the rest of the day. We met at 7.30 am and left the marina soon after. On board were five anglers and a local fishing guru, Bruce Duncan. Bruce is a good friend of Peter's and had been enlisted to assist on board and teach us the finer points of soft bait fishing. Peter and Bruce decided to drift fish a channel that was less than a kilometre from the marina. This was met with astonishment from one angler who had expected that we would be motoring for hours to get to our first fishing spot, rather than minutes. Bruce set the drift and gave us a quick rundown on what to do to successfully fish this channel with soft baits at this stage of the tide. Everyone was keen to get started and for a few moments there were soft baits flying in all directions. One of the anglers, Colin, cast out from the side of the boat amidships and allowed his soft bait to drift towards the stern with the current. Every time he did this the lure was spanked and line hissed from the spool of his overhead reel as the snapper took flight in the shallow water. 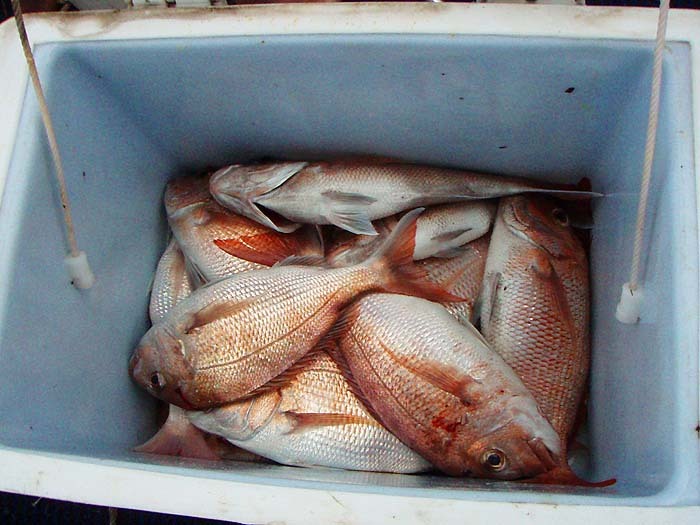 The snapper were feisty but at only 40 cm it did take long to bring them alongside for their guided tour of the fish bin. Colin did this four times before others twigged to what he was doing, followed suit and opened their accounts. The fishing was fast and furious for perhaps 1½ hours until the tide started to slacken towards full. In this time, around 12 keepers were boated. Peter and Bruce held another council of war and decided that the best plan would be to move closer to Rangitoto lighthouse and drift with what little current was available. Once again Bruce set the drift and the water around the boat was immediately pockmarked with the splash of soft baits. The fishing was slow with only the occasional snapper being caught. Bruce by this stage had moved up to the bow of the boat and was engrossed in a conversation with Colin when his Chartreuse Whirl-tail Gulp! (Sounds delicious ML) was absolutely monstered. A snapper this was not! It tore off in a withering burst directly into the current and the rod was bent into a fighting arc in an instant. Bruce picked it for a trevally from the tail beats and when it started to circle the boat his suspicions were confirmed. The fish was determined that it was not moving up through the water column and every time it was drawn upwards the trevally ripped line back off the spool as it went deep looking for an underwater sanctuary. Bruce played it with the finesse of a man that had done this thousands of times before. He used persistent rod pressure to tire the fish and slowly draw it towards the stern of the boat. Eventually the pressure told and a nice 6 – 7 lb trevally was drawn into the net. After lunch Bruce suggested that we used the freshening breeze to our advantage and drift outside of Rangitoto lighthouse across an area of foul towards the main shipping channel. He set the drift and we all cast out. Once again Bruce came forward to the bow and this time he cast behind the boat instead of in front of it. This meant his soft bait was being dragged across the foul in an erratic manner, dictated largely by the drift of the boat. He pointed the rod tip directly at the lure and ran the braid across the end of his index finger to feel the bites. He occasionally twitched the tip to enhance the action and was soon rewarded by a slashing snapper strike. Colin and I had been watching him closely and mimicked the technique as Bruce walked to the stern to land and release his fish. My Zoom lure would barely have touched the bottom when it was spanked by a much better fish. As soon as the hook was set the line poured off the spool against the heavy drag and scythed through the water into the current. I could feel the head thumps of a good snapper and settled in for a decent tussle. This fish behaved similarly to the trevally caught earlier in that it surged away every time its head was lifted upwards. Initially the runs were powerful and the reel screeched in protest as line was ripped out against the drag. However after about 4 -5 minutes of staunch resistance the rod started to take its toll and soon a Snapper of around 5lb lay gasping alongside the boat. This ended up being the biggest Snapper caught all day. We moved a couple more times and drift-fished soft baits until about 4.30 pm when the final call was made to head back into the marina. Overall we’d caught in excess of 50 fish between the 7 of us over the course of the day but had only kept enough for a decent feed each. All of the fish caught were on soft baits. I was the only one to fish with unscented Zoom soft baits all day and interestingly Gulp! baits worked well when the tide was moving in whereas the unscented bait came into its own as the tide reached its lowest ebb. The highlight of the day for me (aside from the fishing) was watching a little blue penguin herd a small shoal of fish into a meat ball and then systematically scythe through the shoal whilst still circling and keeping them tightly packed. We also saw kingfish and kahawai working in the shallows around the lighthouse but unfortunately this area is too rocky for a large vessel to safely navigate. Doesn't it just make you wish that you were out there? Alan's second email dealt with snapper again. This time he had a bit more to say about lures. What strikes me about these fish is just how similar their behaviour is to the black bream which I used to fish for. I suppose it's not surprising because the fish are fairly closely related (for 'snapper' read 'bream'). 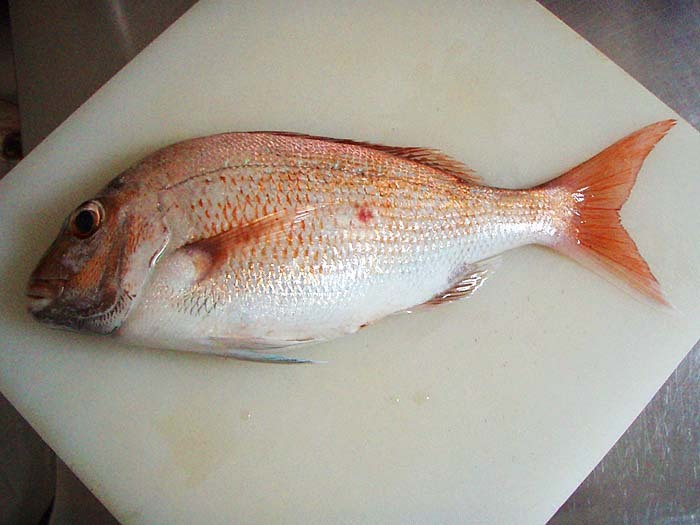 I guess the main difference is that snapper can reach about forty pounds in weight (although most are obviously much smaller)ML. As you are aware I’ve been working with an ex-commercial fisherman, Wayne, to develop some proprietary biodegradable soft baits. We’ve finally got a formulation that he is happy with and for the past three months he has been slaying Snapper all around the Hauraki Gulf consistently with them. For example, last night he went out at dusk and caught 18 fish between 4 and 10 lbs. He rang me when he got home and we arranged to meet up this morning at 6.30 am to try our luck. When I got to the boat ramp it was still dark but the boat was all ready for launching. 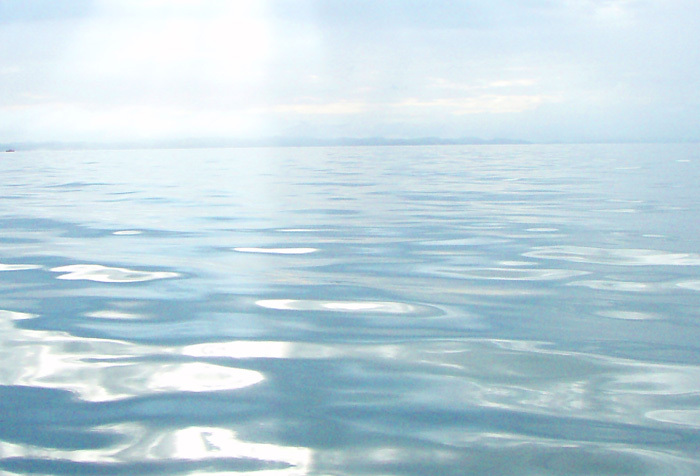 The sea was flat and glassy, so flat in fact that the wavelets caressing the shore seemed to have insufficient energy to create anything but a soft foam. Wayne had brought his best mate Bones (another ex commercial fisherman) along and was keen to get going to fish the same area where he’d had success the previous evening. We quickly loaded my gear, launched the 5.5 metre aluminium boat and headed off at speed to Spot X. Upon reaching the designated area Wayne deployed a drogue and before I’d lifted my rod from the holder the two of them were bouncing their baits off the bottom. Serious stuff! I was keen to rig up and use the same techniques that they’d been employing successfully rather than fish as I’d normally do. Essentially this involved threading a bean sinker onto the trace, adding a luminous bead and attaching a worm hook. 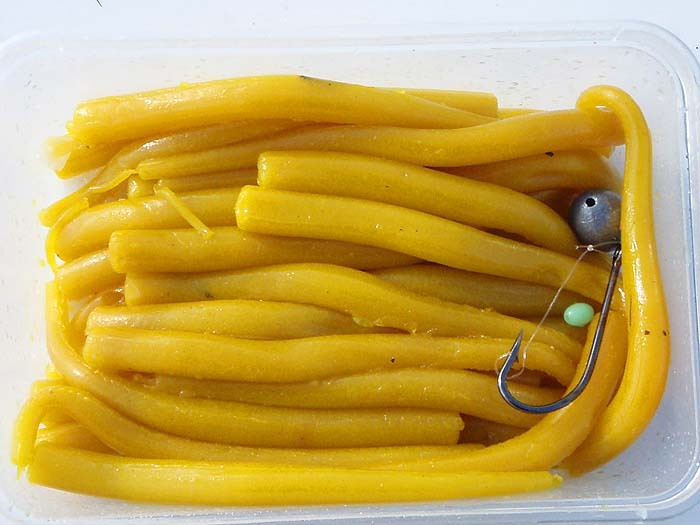 The soft bait is threaded onto the hook so that it is weedless. A toothpick shard is added to the hole in the bean sinker to prevent it sliding up the trace and lodging on the braid/trace knot when fighting a fish. The luminous bead is fitted to protect the hook knot from sinker abrasion. Wayne and Bones aggressively work their worm soft baits using a series of jiggles and pauses as the lure moves along the bottom with the current to induce action. It certainly works as within minutes both of them had landed decent Snapper of around 4 lb. They were using overhead reels which allowed them to feel bites on the drop which is more difficult with a spinning reel. They had both caught a couple of fish before I’d registered my first bite but what a way to start. I’d just jiggled the bait and let it drop when the rod tip was wrenched downwards aggressively. Line poured off the reel when I struck back and the fish headed off upstream into the current. “Better fish” mumbled Bones, “when they take line into the current they’re always decent Snapper”. The Snapper must have heard him and kept on going, all the while shaking its head in disbelief. Every lift of the rod was met with fierce resistance and another withering burst. Eventually I managed to get its head up so that it was fighting the current and rod and before long 6lb’s of feisty Snapper was wriggling against the sides of the net. We had three more drifts and fished for around 2½ hours in total. We caught between 3 – 4 fish per drift and nothing was smaller than 3 lbs. Overall we landed 14 fish. There were a couple caught between 5 – 6 lbs and all of the fish gave a great account of themselves. After I caught a couple of fish using Wayne’s system I decided to revert to a Zoom White Ice shad on a 5/8 oz. jig head to see how it performed versus Wayne’s worms. Interestingly as the tide slackened towards dead low the Zoom soft bait began to out-fish the scented worms. I wonder whether this could be a pattern worth exploiting? Scented bait when the tide is running powerfully and unscented when the tide flow slackens? In both fishing trips most of the fish caught were males. Male Snapper are easily distinguished by the coal coloured patch under their cheeks/chin (see photograph). I wonder when the larger females will start to show up or whether they have been and gone? Great to see that you are back out amongst the Pike. The 22lb fish was an absolute thumper. Well done! I hope that this note finds you, Lilian and the family in good health. The comments about most of the fish being males is again very reminiscent of black bream fishing. I thought that it was possible that, as with our bream, the male snapper were arriving first to defend potential spawning territories. However, a bit of research suggests that they spawn in a very different fashion. 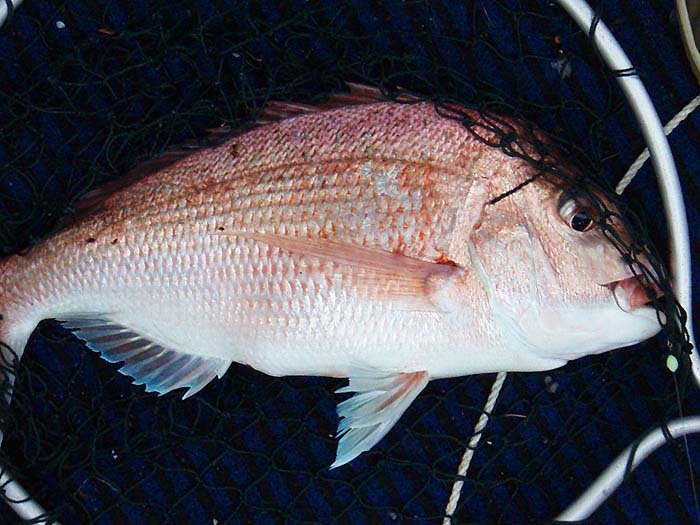 Snapper are reputed to breed throughout the summer, releasing their eggs into the water en masse, rather than luring the females to a patch of bare rock. I wonder why the males and the females seem to be segregating in the Autumn after spawning?